Charles wears a pin on his lapel at all times. The pin has one simple word: ATTITUDE. This pin serves as a reminder to Charles of the importance attitude has played in his success, and the importance of maintaining a positive attitude despite the challenges he has faced. Many people have noticed or commented on this pin, including complete strangers in airports. 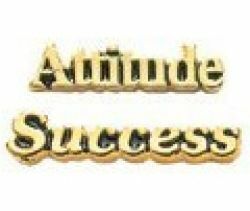 Charles now makes these attitude and success pins available to you.